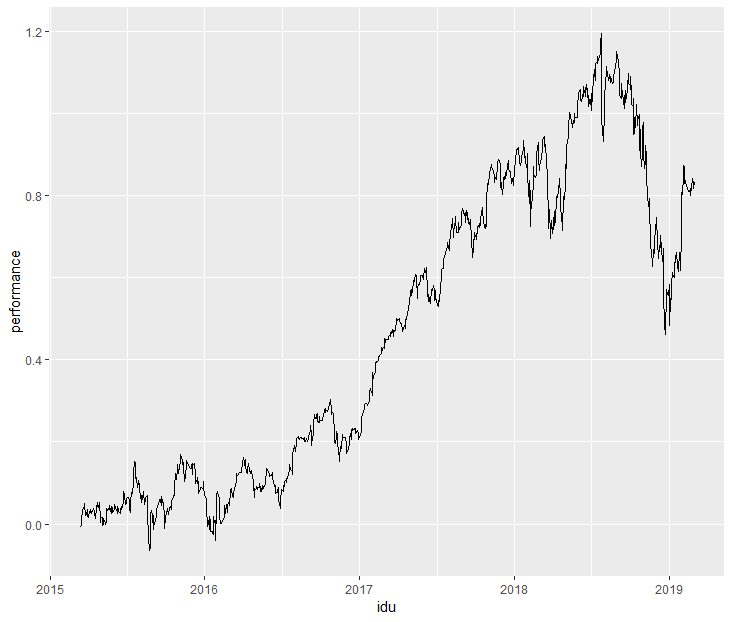 I've downloaded adjusted closing prices from Yahoo using the quantmod-package, and used that to create a portfolio consisting of 50% AAPL- and 50% FB-stocks. A cumulative performance above 100% seems very unrealistic to me. This lead me to think that maybe it is necessary to adjust/scale the downloaded data from quantmod before using it? Have you checked the performance of the particular stocks? So this seems quite realistic (and you may verify this performance via other sources as well). However, you should properly merge the time-series on their timestamps. Also, the portfolio performance you compute assumes that you rebalance to equal weights every period (i.e. day). Not the answer you're looking for? Browse other questions tagged portfolio-management returns quantmod or ask your own question.